You want one of a kind Senior Portraits that explore the many things that make you who you are! You want to celebrate being a High School Senior and at the same time show you are on your way to being a grown up. You want to look natural and feel comfortable in front of the camera. You want to expand your horizon and go on a little adventure for the afternoon. I've been known for my unique take on Senior Portraits in NW Indiana for nearly 20 years. You love Fashion, let's showcase that. You love playing your instruments, art or sports? Let's showcase that! We are so much more than we give ourselves credit for. I just love exploring with you what it is that sets you apart from someone else! It's my wish that you embrace your one of a kind beauty and just have fun during your portrait session. It's like hanging out with a girlfriend! Your professional senior portraits are not just for your grad invites and open house. They are for the rest of your life! I will be with you every step of the way and promise you, it's one of the most uplifting experiences of your life! It's an exciting time and the possibilities are endless. Photographs increase in value over the years, this time will never come back. Today can never be captured tomorrow. I am looking forward to your Senior Photo Session and meeting you! For your BIG CITY SESSION we can go to Chicago and explore where the city takes us. These sessions are limited and there is only about 5 spots available each year. It will take up most of the day and is the most fun session I offer. Although we don't necessarily have to go to the beach, we can travel a bit outside of Crown Point. Let's explore areas outside of Crown Point, such as Miller/Gary area. In the Fall we can go to County Line Orchard or Deep River Park. I love this session for it’s versatility. For your AROUND TOWN SESSION we will stay local to 46307 and do the session mostly around the Courthouse Square. We will find great spots for an urban look and also a park or field close by for open skies and wind blown hair. All locations must be within 5 minutes of Crown Point. actor and model portraits of the late 90's. I offer this as an add on to your Senior Session. $450 at a later point! Since I want everyone to have an iconic print, I include an 11x14 Heirloom Canvas Print as a Keepsake. If you are only interested in these type of shots, the cost starts at $750. Looking for a different Senior Photo Session? Please inquire! I want everyone to have their own unique cards, so instead of offering standard layouts, I let you choose something you love. Please go to www.etsy.com (if you are not already addicted to etsy you will love what you find there!) and in the search bar type in something like 'Graduation cards' or 'Senior announcements' etc. Look through all the different options from different sellers until you find something. I need a psd layout, so it can be customized. Simply forward me the link to your favorite card and I will then buy it and be able to lay out your card. Depending on how many pictures your layout calls for, please e-mail me the jpg file numbers and the wording. I will then send you a preview and within a few days your card will be printed and ready! 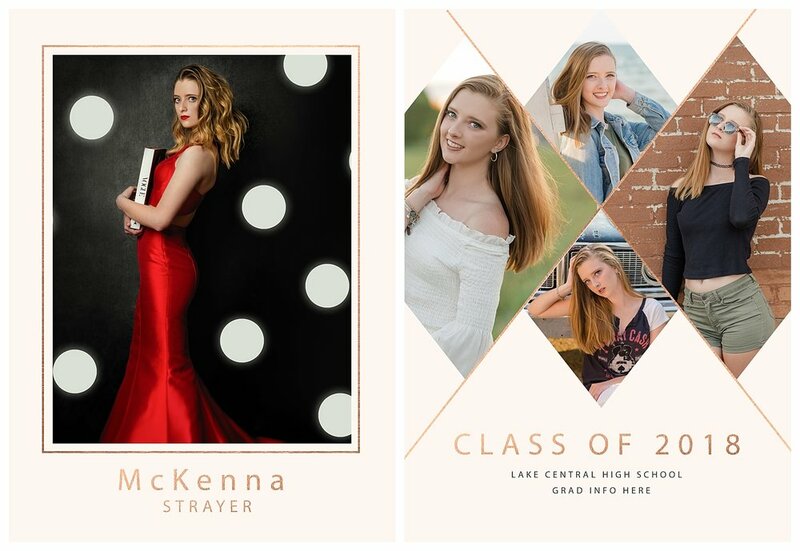 Here is a few sample layouts from a few of my seniors. Click this to see how it looks like on etsy! Why should you hire CHC-Photography, Inc. for your Senior Pictures? I've been doing senior portraits in NW Indiana almost 20 years. It's my favorite type of session. I love exploring personalities and bringing ideas to life! If you want something a little different then I am the right photographer for you. I love to create art with my seniors. It's one of a kind just like YOU. Of course you get some of those typical smiling in the camera shots as well. But I love to take it a step further and bring out something else. It's usually not planned other than you brought your prom dress and instrument with you for example. It's very spontaneous and in the moment! It's all about having fun and being relaxed. Where should we go for my senior portraits? I am always on the look out for new locations and I have a few favorites. If you have suggestions that is always welcome! Where we go depends on your style, whether you like fields and trees and/or the urban look of old buildings and brick...or maybe you want to go downtown Chicago or Indy. I could even be persuaded to do a shoot in NYC. I love a good mix of everything and encourage you not to limit yourself to one look. as soon as possible...once the weather warms up, I get crazy busy! Since we never know how the weather might be, it's a good idea to schedule a back up date. Watch this for some inspiration! Plan on 4-5 outfits. I always say, bring more and we'll go through it! Definitely bring your favorite outfits but also something to dress up a little. Avoid big patterns for the most part and logos unless Abercrombie pays for your senior portraits! Think about 10 years from now, how you don't want your clothes to date all the photographs - something timeless that helps show off You...like something that brings out your complexion/eye/hair color...That being said I love if someone has their own sense of style and with a couple of your outfits you should really go for it! Of course I like accessories galore...a long (lace) kimono (I love bohemian style clothing), hats, scarfs, jewelry, cool shoes, jackets...etc. My personal favorite places to shop for photo shoot clothing are Akira, Zara, Free People, Forever21 and H&M. What else should I bring? Props? Bring some water to stay hydrated! Flats to walk around in! Bring anything that you want in the pictures! Your sports gear, your instrument, a book you love, your best friend, your pet, anything that means something to you! Everyone has a story. Don't let anyone put you in a box! Let's explore your tomboy and girly side!!! Grooming and tanning before a photo shoot? Makeup? Girls - I know girls are obsessed with tanning and sun bathing these days! I will charge extra to remove those tan lines...yep! If you do the spray on tanning, please do it a couple days before the shoot, so that most of it washes off and you don't look orange in the pictures...trust me natural is better anyway! As for the hair...I know straightening is super in but it damages hair and even the best photo shop editing skills can sometimes not hide that...a hair trim can be very helpful! Just saying! Oh, and the make-up...I'd be happy to help you do your make-up! If it's in the budget I recommend getting your make up done professionally. I can give you recommendations! I know a lot of seniors have friends who are doing the make-up the day of the photo shoot and all I can say is that I am usually impressed! On a site note, I do not recommend false eye lashes unless you wear them every day and have some very natural looking ones. The ones that are super thick often don't let the sky reflect in your eyes and that can be a problem...A daytime smokey eye can be amazing and honestly youtube has some great tutorials...play around in the weeks prior to our shoot and see what you like! And please please take a look at your toes and finger nails the week prior to our photo shoot. I have way too many seniors showing up with chipped nail polish. Hands are very important for senior pictures! Schedule a mani/pedi a couple days before your shoot! What is the expected cost of my senior portraits? please read the details under Session Prices. Around Town sessions start at $349 (includes $150 towards prints). Payment is due in full the day of the photo shoot. If a photo shoots is scheduled many weeks ahead of time, I ask for a $100 retainer to hold your date. I accept cash, check or I can send you a paypal invoice (can be paid with credit card!) 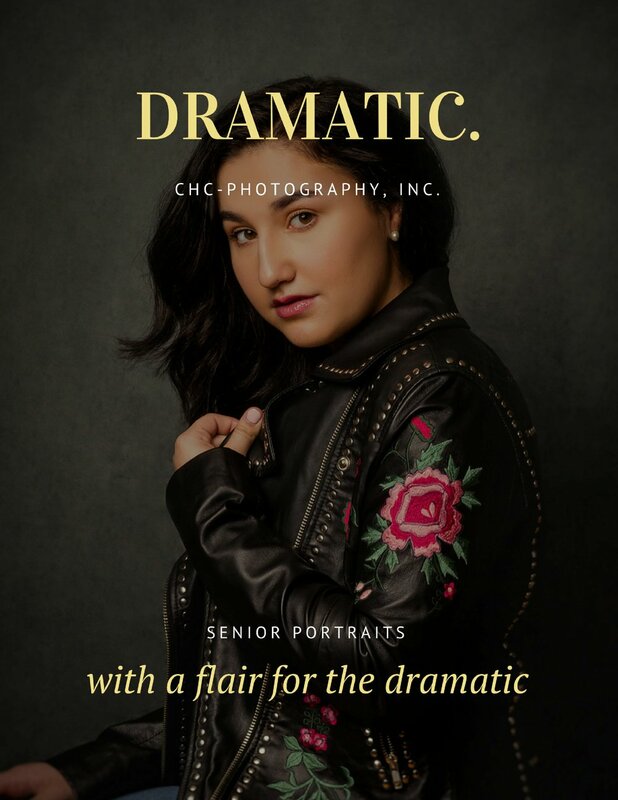 Checks need to be made out to CHC-Photography, Inc.
My main goal is to capture the feeling of being young and carefree ... let go of all your fears and just be YOU! Can I bring my mom and/or a friend? Sure! Bring whoever makes you feel comfortable. Although mom's often tag along, I appreciate that they are usually staying in the background so as not to embarrass their kids too much...if your friend tags along I might put them to work holding something, like a reflector or so....you've been warned! These are not models, they are High School Seniors! I love creating art with them, something that will stand the test of time and be beautiful forever! Within 2-3 weeks after the photo shoot, I will e-mail you the link to your on-line gallery where you can view and order your images. Once I receive payment, I will process your order and within 2-4 weeks I will mail it out or you can pick it up! You will need to sign a model release on the day of. It will state that I can and will post some of your pictures to my website and/or social media and reserve the right to use your images in advertising materials. How should I book my appointment? Best way to contact me is always by e-mail at carmen@chc-photography.com or you can call me at 219.308.4599!